Let’s get real. While I post some pretty decadent stuff around the blog, we don’t always eat like that. I promise. 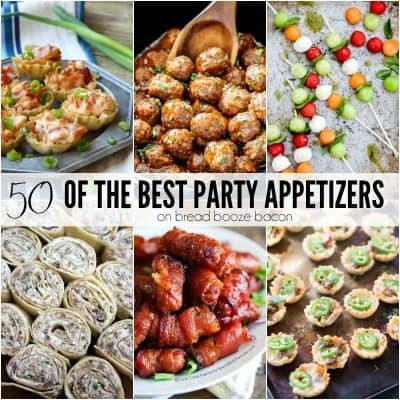 But when we have friends over to watch a football game or have a birthday party I like to slip in a pan of chicken wing dip or Hawaiian Pizza Sliders with the other foods. That way I can have a just a bit without feeling guilty about all those leftovers. Prudent planning friends. 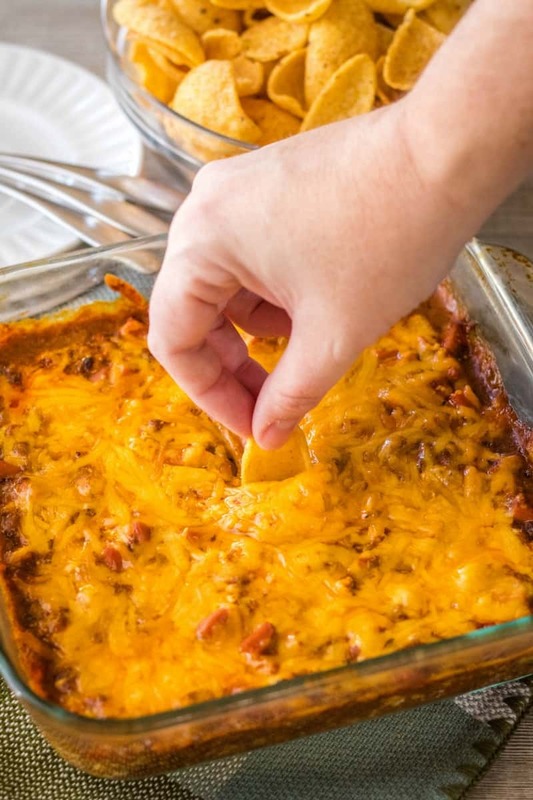 As you can imagine this Chili Cheese Dog Dip falls into my party food list. It’s a cheesy, meaty dip that’ll make you wonder why you haven’t always eaten your hotdog this way! For me, chili cheese dogs are one of those sometimes food cravings. Mike and I hit up Freddy’s and each get a chili cheese dog combo, no onion. It reminds me of when I was little and my mom would make hot dogs in mac and cheese. Yes, I know there’s chili involved, but it’s the same food vibe and I get really happy eating it. Sometimes you just want that happy food place in your brain. 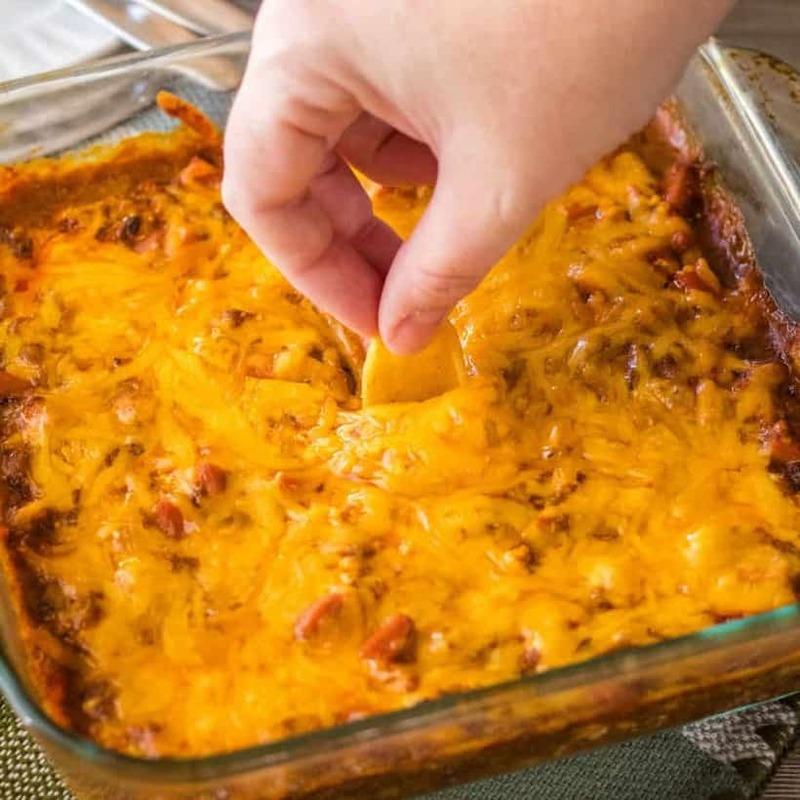 While this dip is indulgent, it’s also low carb with lots of cheese, meat, and no beans. Just grab some low carb chips or crackers for dipping…or eat it right off a spoon. I won’t judge. 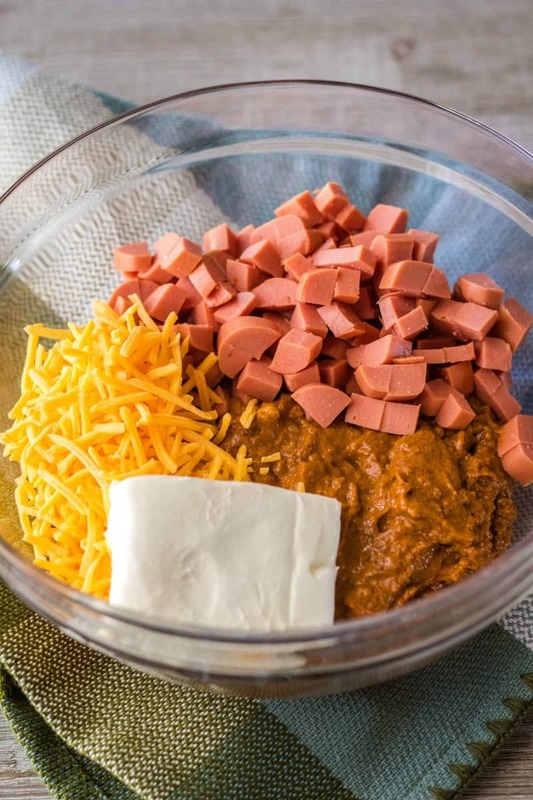 In a mixing bowl, stir together cream cheese, cheddar cheese, hot dogs, and chili. 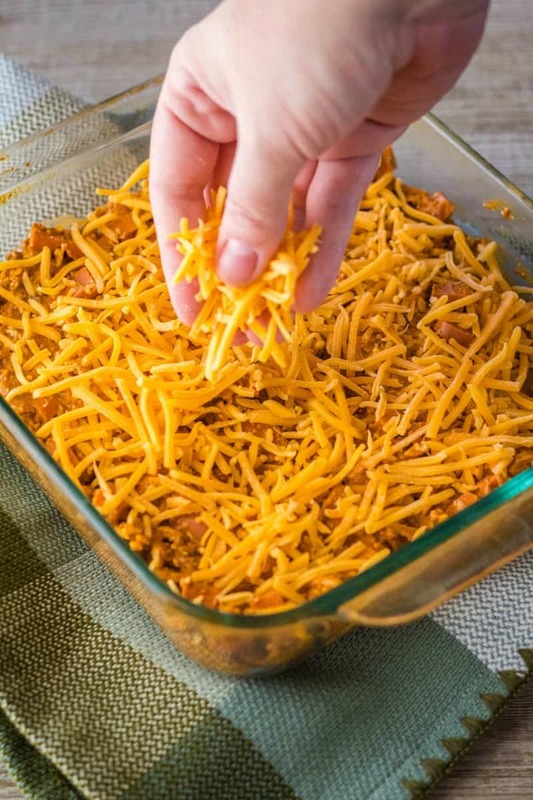 Transfer to a baking dish and top with more cheddar cheese. Bake until cheese is bubbling and melted. Serve warm with corn chips or bread pieces. Super easy, right? Mike and I like using the big Fritos scoops for this dip. It’s kind of like the best Frito Pie you’ve ever had. Not to toot my own horn. It’s also really good if you tear up Hawaiian rolls into small pieces and use them for dipping. I may have even been known to follow out a Hawaiian roll and fill it with this dip. Ooooo, you could even do that with the dip ingredients! 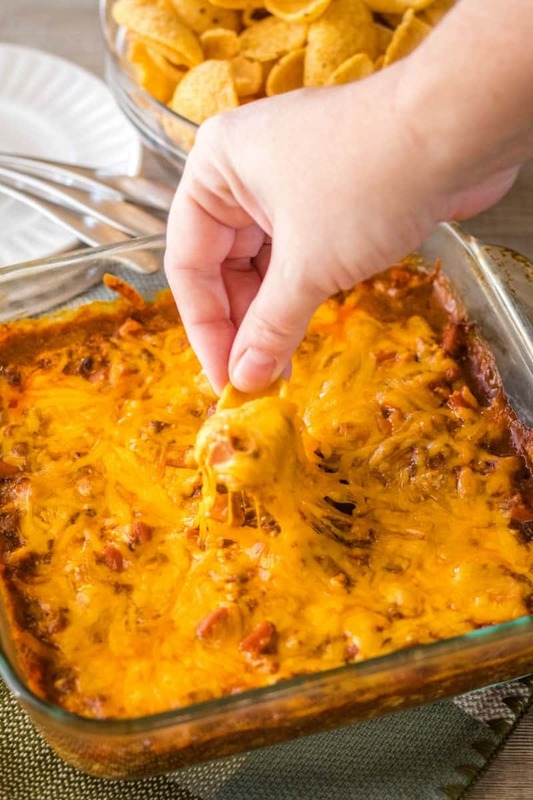 Fill up hollowed out Hawaiian or dinner rolls with the dip mixture, pop ’em in a baking pan, top with cheese, and you’ve got yourself a chili cheese dog bake! Oh the possibilities! 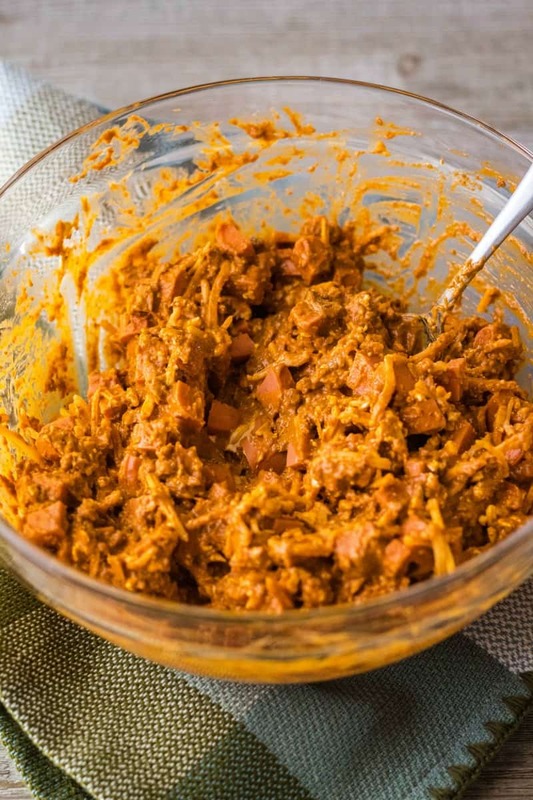 In a medium mixing bowl, stir together chili, hot dogs, cream cheese, and 1 cup cheddar cheese, until evenly combined and cream cheese is completely incorporated. Transfer to an 8-inch x 8-inch baking dish. Spread dip into an even layer. Sprinkle top of the dip with remaining 1/2 cup cheddar cheese. 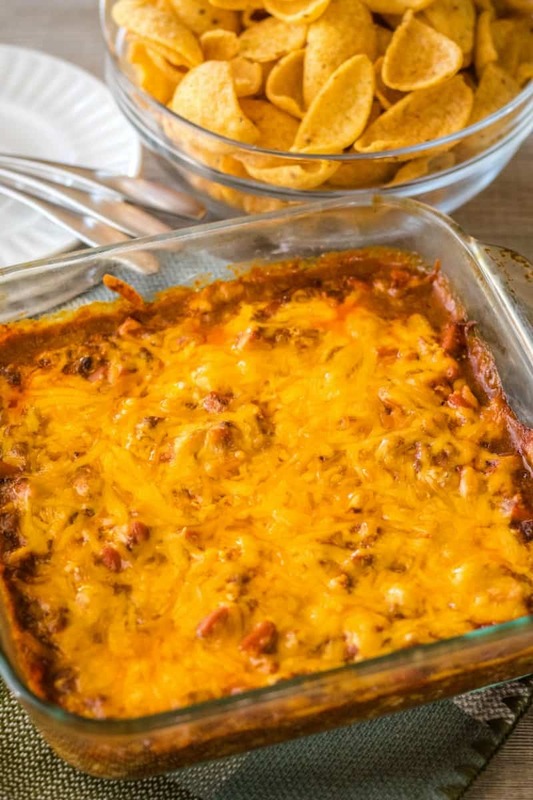 Bake 25 to 30 minutes or until the dip is bubbling and cheese is melted. Serve warm or at room temperature with corn chips. How have I lived this long without hearing about this dip. It sounds delish. I can’t wait to make for try. Hope they will be yummy as yours. 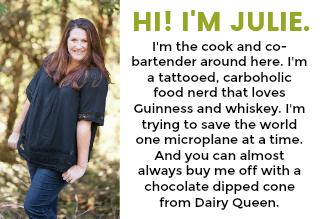 Thanks for sharing the recipe Julie!